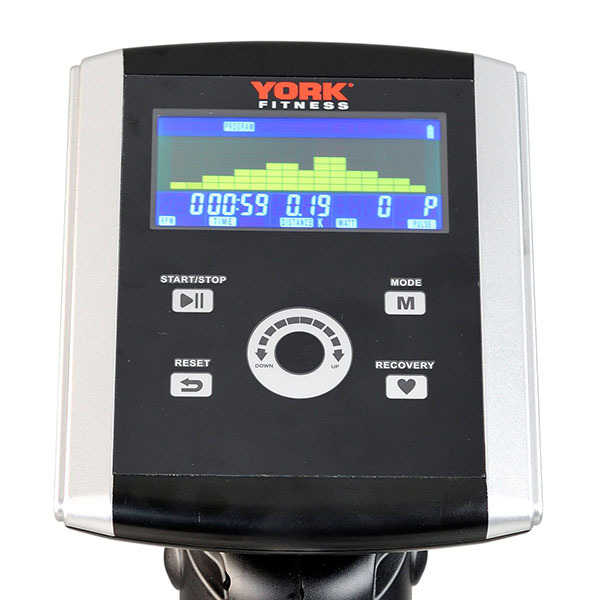 Having tested out York’s Perform range of crosstrainers in the past, which generally impressed, we were keen to see what the extra investment of an ‘Excel’ machine gets you! There are 2 models in the range, and today we test out the rear drive machine – the York Excel 310. 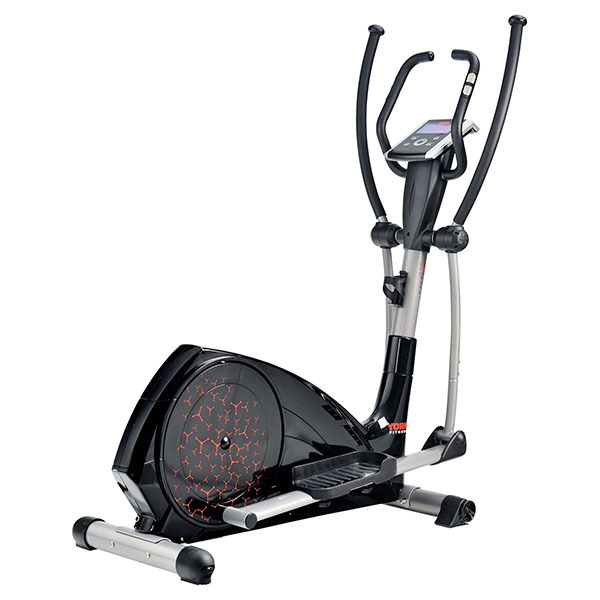 Once assembled, the Excel 310 elliptical is a great looking machine with little touches of detail such as chrome pedal inserts that convey real quality. 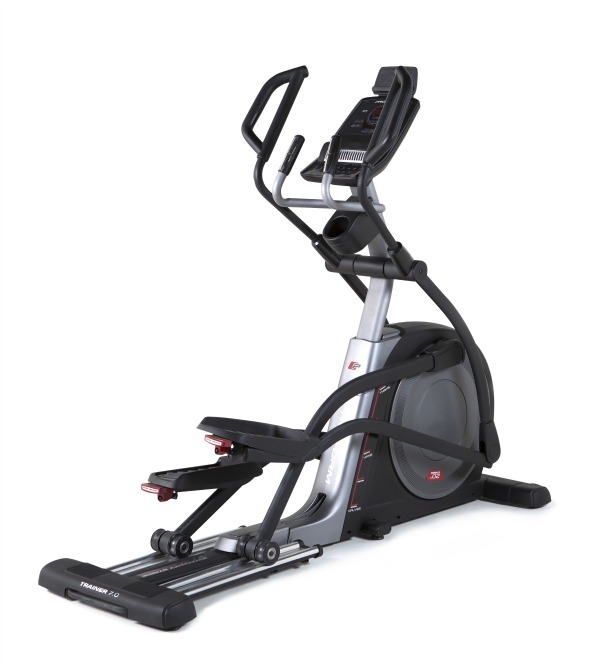 It has a chunky frame with 3″ oval crank arms and everything works together to give a feeling of great stability in use. Another rather nice, quality feature are the adjustment dials on the ends of the stabilizer braces on the floor. Unlike so many machines that require heavy lifting to get at the levelling feet, the ‘310’ has exposed twist dials that can be turned to adjust the levels of the foot pads quickly and easily. As well as being very stable, it seems that the ‘310’ is built to be quite durable too. The machine has a maximum user rating of 130 kg (over 20 stone) and we are as confident as York in that figure (it certainly coped admirably with our 120 kg Reviewer – Charlie Rawes). 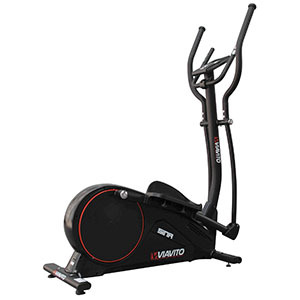 The stride length is 16″ that is generally considered slightly restrictive for taller users (over 6′) but our reviewer is 6’2″ and found it to be perfectly adequate. Being a rear drive model, the pedals are having to revolve around the bulk of the flywheel casing, but the 6″ Q-factor (space between the peddles) but once again the design couldn’t be faulted – the hips and knees remained in a comfortable position throughout and the motion felt great! 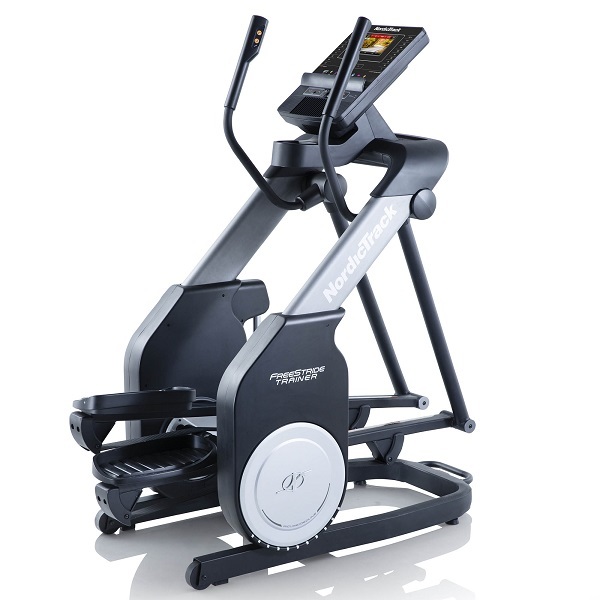 The flywheel, at 13.5 kg (nearly 30lb) is one of the heaviest you’ll find on any York ellipticals and the smoothness and fluidity at which it spins is superb. The Excel 310 is a self generating model which does away with the need for any plugs, so it can be sited anywhere in the home without a trail of messy cables! When you begin pedalling the console bursts into life and you can appreciate the snazzy blue backlit buttons and 2 colour LCD screen. This is the same console as is on the more expensive front drive 320 model, aside from there is no inbuilt heart rate receiver. We can appreciate that throughout ranges the manufacturers have a commercial interest in holding back certain features to offer more incentive for extra investment in their more expensive models but at this price point we really would expect wireless heart rate monitoring as standard. The other slight disappointment is that we noticed an absence of one of our favourite York features that we’ve enjoyed on their cheaper ‘Perform’ machines – the Body fat program. Sadly this console doesn’t calculate your body fat percentage or BMI but we’re pleased to see that the ‘Recovery’ button is still present. This is a neat feature to be used at the end of your session. 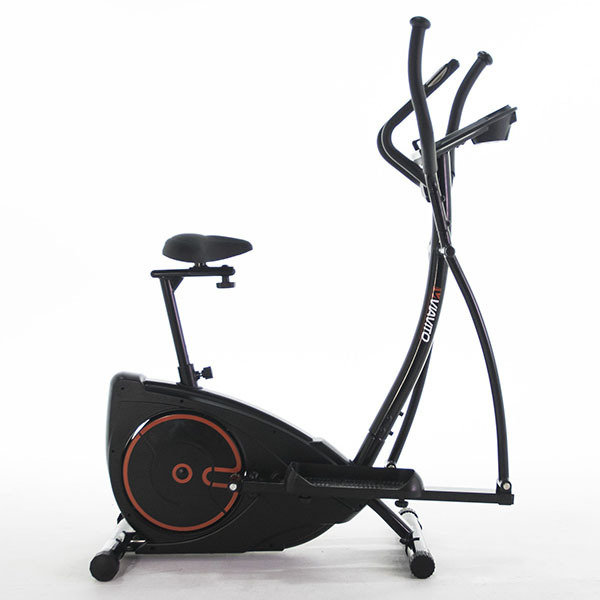 By entering ‘Recovery’ mode and holding onto the pulse grip sensors on the handlebars for a 60 second long countdown, the computer monitors your aerobic recovery and a score appears on the display from 1 – 6 (a score of 1 being ‘Outstanding’ and 6 being ‘Poor’!). There is a selection of 12 pre-set programs which are fairly standard fare but there is the option to create and save your own customizable session from scratch with the User program. It’s during setting up and making adjustments to levels that we really appreciate the central shuttle dial (aka ‘jog wheel’ ). This revolving control makes light and 50dy work of it with the turn of a finger! Heart rate controlled programs work by the computer automatically controlling the intensity to keep you within the right training zone. The Excel 310 has 4 of these H.R.C programs to choose from (55%, 75%,90% or there is Target HR where you can set your own % level to work within.) Although, these work well and are an invaluable asset to training routines, their accuracy is obviously compromised by the fact that you have to use the pulse sensors as the method of monitoring in the absence of wireless transmissions. The other drawback with this method is that you have to maintain your grasp on the static handles at all times. Although it has to be said that they are very comfy handles, it’s a shame you can’t enjoy the extra benefit of working the upper body using the dynamic arms during H.R.C sessions. Now before these grumbling make you lose interest in the Excel 310, let us now mention the ace card!…. Resistance!! York have equipped Excel machines with one of the best magnetic resistance systems we have ever tested. There are 32 levels, that can make your muscles feel ‘Oooo!’ to burning like ‘OUCH!!!’. 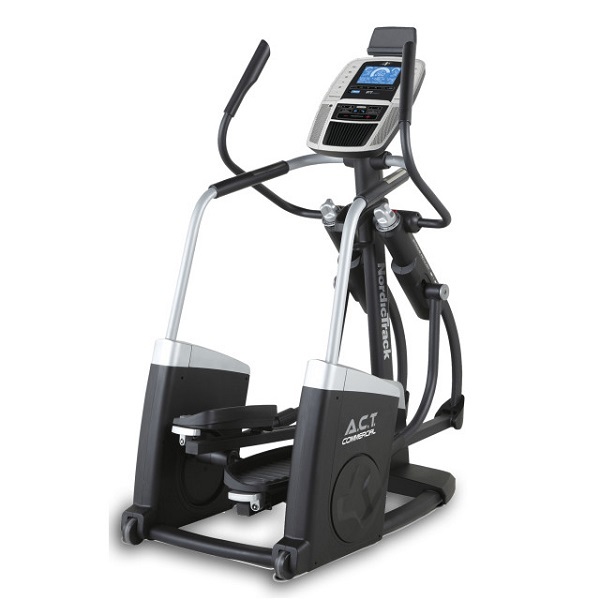 Having so many increments makes this machine ideal for all fitness levels as there is so much scope for long-term improvement. So what’s the overall verdict? The Excel 310 is unquestionable a good-looking and well-made machine with a wonderfully smooth action. It also has a console that’s intuitive and easy to read so it’s very user-friendly too. That said, there are 2 main areas that this may disappoint: there’s no inbuilt receiver for wireless heart rate monitoring and there’s very little in the way of motivational features. If you’re a fan of inbuilt technology such as internet connectivity, speaker systems, MP3 docks and such like, then we’re sorry to say that this machine doesn’t have any of it! 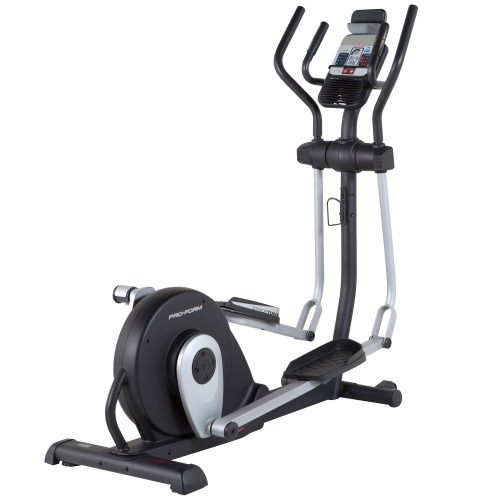 Ideally this model is suited to someone who is looking for a basic, durable machine that has a great action, basic programs and HEAPS of resistance whenever needed! This model certainly has everything a self-motivated user could need to deliver fantastic results in terms of total body, muscle toning, weight loss and conditioning. 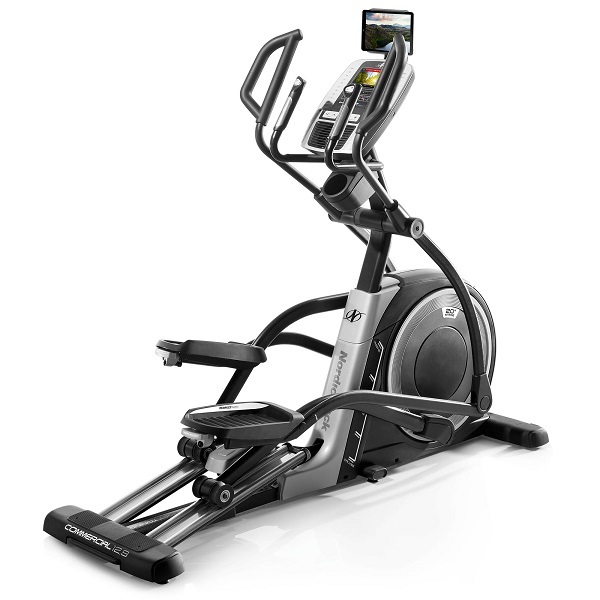 So if you’re searching for a capable fitness machine to work towards those goals, the Excel 310 Elliptical could be the ‘tool’ you need! The York Excel 310 Rear Drive is not currently available from any retailers we're aware of in the UK. 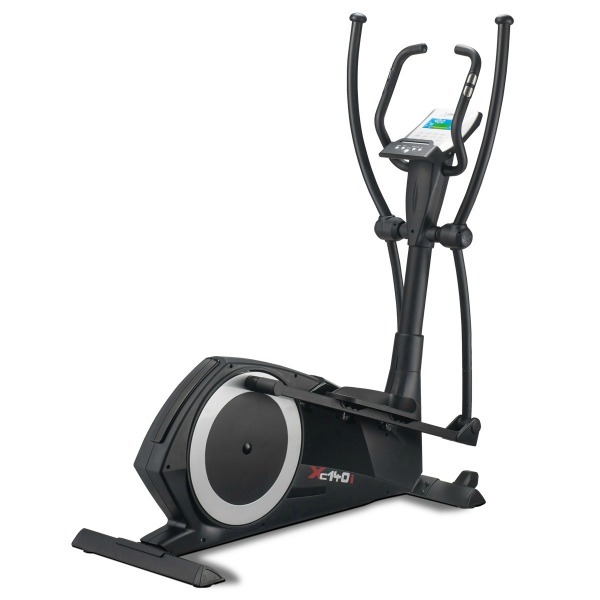 With the Excel 310, York are demonstrating that they can certainly bring a quality machine to the market, even though they've built their reputation at the budget end of the fitness machine market. However, the lack of a wireless receiver in the console is a really negative surprise, as a machine at this type of price point really should have this! 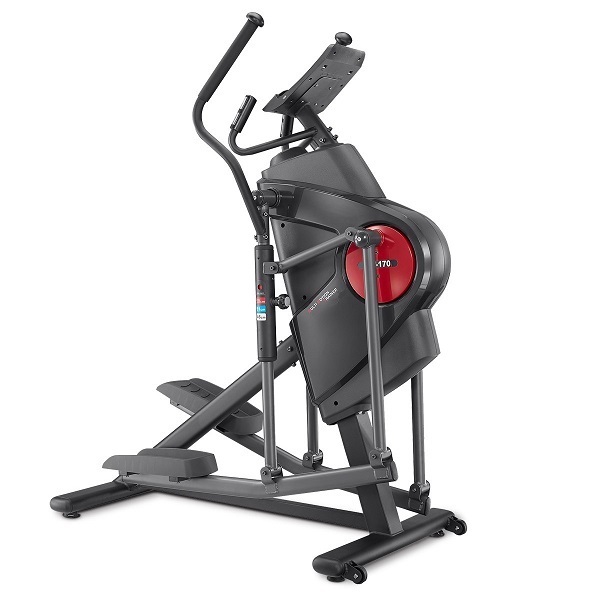 Just take a look at our current elliptical of the month, the Proform 7.0, and compare it to the Excel 310 and it becomes easy to see just why, as good a machine as this is, there are better choices available at the moment.